Used manual in good condition. 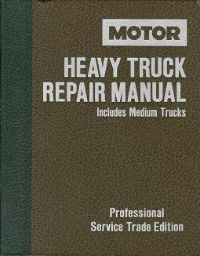 This edition of the MOTOR Heavy Truck Repair Manual covers mechanical specifications and service procedures on 1989 - 1996 Medium and Heavy Duty Truck models plus selected 1997 models available at time of publication. Data reported in this manual is subject to change. To report current additions or revisions between editions of this manual, a "Manual Update" page is published every month for your guidance in MOTOR magazine.